Australian Catholic Bishops Conference. 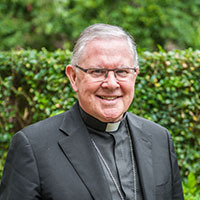 Currently the Archbishop of Brisbane, he previously served as an Auxiliary Bishop in Melbourne and as Archbishop of Canberra-Goulburn. In this conversation with the ACBC Communications Office, he speaks about his appointment at a critical time for the Catholic Church in Australia. What strengths do you think your brother bishops saw in you that gave them the confidence to choose you to lead them at this critical time? I guess a certain range of experience was a factor. As a bishop, I’ve been a rolling stone for quite a long time; I’ve seen the Church in Australia from south to north, from city to country. Other factors may have been an ability to put words together in the public forum and a certain vision of the way forward for the Church here, focusing on the Plenary Council. But, in the end, these things are a bit mysterious. As you are entrusted with the role of leading the Australian Catholic Bishops Conference, what great challenges do you see? The great challenge is to do what I can to help the whole Church move from the Royal Commission to the Plenary Council and all that lies beyond it. This will mean helping the Church find a distinctively Gospel voice in the great social debates – not fighting ideology with ideology, but engaging issues with the power of the Gospel. That will mean working to make sure Jesus is at the heart of everything. In the end, He’s all we’ve got. And He’s the only one who’ll enable us to meet all the challenges. You’ve said that despite those challenges, great opportunities also exist. What are some of those opportunities? Throughout history, the great surges of Gospel energy have come when things looked grim. That’s where we are now. The great opportunity we have is to open ourselves to the power of God in our weakness and allow God to build a new and unexpected future for us. That will mean a humbler, simpler and more joyful Church. It will also mean a more missionary Church. You mentioned the Plenary Council 2020, of which you have been a great supporter. How can it be the process of renewal and revitalisation that so many are hoping for? The Plenary Council was a decision of the bishops, but I’m convinced it is the work of the Holy Spirit, who alone can renew us. If it’s not the Spirit’s work, then it will be merely administrative or political, and there’s no renewal there. The Spirit is asking us to listen in deeper ways – to God and to each other. Then we’ll have to decide and act. The Plenary Council isn’t a talkfest; it’s a time to discern, decide and act. If we do that under the influence of the Holy Spirit, things will change in unexpected and hope-filled ways. How can the Church be the face of Christ in Australia – not just in our pews, but in our homes, our streets, our schools, hospitals and prisons? We may be diminished in some ways, but we can’t allow ourselves to be pushed into a corner of private religion. The Catholic instinct is to engage the wider culture and we’ve done that powerfully in Australia. But it won’t be as a political or economic force, nor as some large lobby group promoting its own interests. Our engagement will be driven by the Gospel, which means we’ll be a servant Church out in the streets wherever human need is found. The Church has been deeply scarred by the tragedy of child sexual abuse, laid bare so starkly during the Royal Commission. How can the Church recover from such a profound loss of trust? The first thing we need to do is to see through the eyes of those who’ve been abused and see them not as the other but as our own. In a sense, they will have to lead the Church beyond the horrors of abuse. Then we need to repent, which is not just saying sorry, but working to ensure that the Church is genuinely safe and caring, so that trust is rebuilt. We also need to ask what it was in Church culture that allowed abuse to happen and to be so grossly mishandled by Church leaders and to change the culture wherever necessary. Much has already been done, but there’s a long journey ahead of us. The bishops know that and are determined to do whatever the Gospel requires. There is something of a tension that exists between the desire for strong episcopal leadership and the desire for an increased involvement from the laity. Who must shape the way forward for the Church? Everyone in the Church – lay people, consecrated religious, the ordained. The work belongs to the whole communion of the baptised. Each has received gifts of the Spirit and we’ll need all those gifts as we move forward. We’ll also need to hear all the voices, because each has heard the Word of God and has something to say. But the wider society also has a part to play. Society receives from the Church, and the Church receives from society. Therefore, we have to be alert to the promptings of God in the secular world, which can be less irreligious than it seems. The Church serves God; we don’t own God. The Church in Australia is – and can often seem – far removed from Rome and the Pope. What lessons can Pope Francis offer you and the Australian Church? For me, Pope Francis has been fundamental in helping us hear the call of the Gospel anew. He’s been a gift of the Holy Spirit. That’s why he’s intimately part of our Spirit journey, even if he’s far away. He models the episcopal ministry in new ways, speaking a language that people get – even people outside the Church. He’s also calling the whole Church to be more Christ-like. That’s why his letter Evangelii Gaudium, The Joy of the Gospel, is I think a providential charter into the future. I’ll have it close at hand for as long as I’m president of the Conference. This entry was posted in Uncategorized on May 10, 2018 by ACBC Communications.